The newest thing in on-the-go flavour. 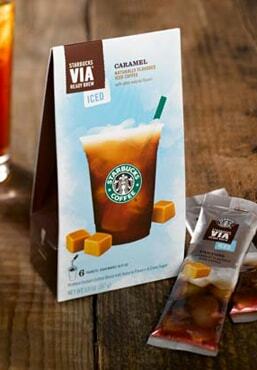 Introducing Starbucks VIA® Caramel Flavoured Iced Coffee. Now you can enjoy a crisp, cold, naturally flavoured iced coffee wherever summer takes you. Using 100% natural roasted arabica beans, we created a blend of instant and microground coffee that is specially designed for mixing with cold water. Then we added just the right amount of buttery, velvety caramel flavour and pure cane sugar for the perfect balance of refreshment and sweetness. It’s the sweet caramel coffee flavour you love, wherever and whenever you want it. But just like the summer weather, Starbucks VIA® Caramel Flavoured Iced Coffee is only available for a limited time. A picnic in a park and a cold bottle of water.